The new H30D-C039 from Prolyte is a 3-way corner where the downward leg is placed in a central position. This means you can create goal posts or square grids on legs with only one type of corner. 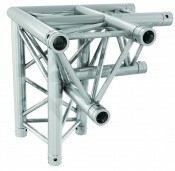 Forget about left and right positioned legs, this corner will not only simplify assembly, it will also optimize your truss inventory. This new corner does not replace the H30D-C012 and C013 - they will remain available. The H30D-C039 is now available.